This return to form cements Dream Theater as one of the finest heavy, progressive rock bands of all time. A Dramatic Turn Of Events has been eagerly anticipated for the past year — fans have been desperate to hear what has become of the band since the departure of founding member and bandleader, Mike Portnoy, at the end of 2010. The wait is finally over, and brace yourselves for a remarkable work and crowning achievement for the band. This is a crowned jewel in the Dream Theater collection. One listen to A Dramatic Turn Of Events and long-time Dream Theater fans will immediately get a sense that the band has been liberated by the absence of Mike Portnoy. The exceptional songwriting on A Dramatic Turn Of Events sounds like the most balanced effort these guys have produced in a long time, and it’s easily their finest record since Six Degrees of Inner Turbulence. Fans of earlier Dream Theater works going all the way back to Images and Words will be right at home with this release, which is often times more prog hard rock than prog metal. Never fear, headbangers…ADTOE is routinely filled with guitarist John Petrucci’s modern metal guitar assault and killer double-kick chops from newcomer Mike Mangini. But here, Petrucci’s guitar is beautifully balanced with the most significant contribution from keyboard Jordan Rudess we’ve noticed in a long time. There is a lot of piano and orchestration on display throughout the album, with so much showcasing of Rudess’s formidable piano chops that pointing out specific examples seems almost pointless. Classic Dream Theater trademarks abound, like the way they can throw some truly insane and odd-time riff sections right into the middle of melodic chorus patterns, or change sound and style mid stream for just a few bars or two. The keyboard and guitar dual lead shredding on songs like “Lost Not Forgotten” and “Breaking All Illusions” will bring longtime fans back to that familiar place where they just sort of sit there listening to the band and collectively gasp at the technical proficiency of these masters. It’s one of those albums that either inspires you to practice more or to hang it up and give up playing, depending on your personal character. Of course many of you are wondering about the revamped rhythm section. Bassist John Myung is inspired on this release, and his parts cut beautifully through an outstanding mix from Andy Wallace. Myung obviously became quite comfortable playing with newcomer Mike Mangini quickly, delivering some great standout (and solo) bass sections that immediately caught our ears, and he even returned to contributing some new lyrics, too! So what of newbie drummer, Mike Mangini? Fans were treated to an hour’s worth of drummer audition videos last winter, and we saw/heard that he had the ability to nail Portnoy’s most challenging metal mayhem. Thankfully, A Dramatic Turn Of Events offers much more than a rehashing of Portnoy’s typical double-kick mayhem. Yes, Mangini delivers plenty of impeccable and solid double-kick driving, but he also plays with more of the finesse that Portnoy showed on earlier Dream Theater releases. The songs were in development before Mangini came in to flesh them out and lay down his parts, and on his first effort with the band, Mangini’s style sits firmly within the bounds of what you’d expect to hear from Dream Theater, but it’s interesting to note some real differences in the sound of his Pearl/Zildjian drums and cymbals from Portnoy’s Tama/Sabian kit. As for style, he’s got that in spades. He was teaching drumming at Berklee before this gig, you know. As for answering the “who’s better” question, we’ll leave that debate to the forums. There is so much more to this album than shred, however. This album is melodic throughout, and frequently epic. Petrucci has likened it to a roller coaster ride, and we hear that. It’s definitely a real album listening experience from start to finish, and it has great pacing throughout. Coupled with the great mix and mastering, it doesn’t wear you down after repeat listens. In many ways, this record strikes us as a cross between Awake and Falling Into Infinity coupled with the evolution of Petrucci’s heavy guitar riffage and balanced with Rudess’s otherworldly keyboard chops. This album has plenty of hooks and melodies, and we loved the closer, an acoustic guitar driven ballad, “Beneath the Surface,” which had some great orchestration that grew from a cello line into a quartet and then into… a Keith Emerson-like Minimoog solo! There was more acoustic guitar on display throughout ADTOE, too, like on the epic power ballad, “This Is the Life,” in which Petrucci and Rudess trade acoustic guitar and piano seamlessly. And what of our old friend, Jame LaBrie? He shines on this album, with some of his finest and most emotive singing ever. Gone is that growling, grindcore stuff that young metalheads call vocals. It’s all real singing here, and it sounds fantastic. Dream Theater set the benchmark for progressive metal music, and with A Dramatic Turn of Events, the band has raised the bar even higher, delivering an hour's worth of music that takes you on an incredible musical journey from the tight and heavy to the enchanted and orchestral. Inspired work to be certain. Father Portnoy, you raised your child well. This band keeps getting better and better! When 3 first came to our attention, I didn’t embrace the band, and my review of their output showed it. They were a bit too progressive without enough melody and harmony to make the music accessible, despite showcasing some fantastic musicianship. I was also pissed off that they “borrowed” the name of the classic one-album band featuring Keith Emerson, Carl Palmer, and Robert Berry (but hey, it’s not like those guys are using it anymore). Fast forward to the release of The Ghost You Gave to Me, and now I’m singing the praises of this band that has nothing left to prove chops-wise and is now writing infectiously catchy music that crosses multiple genre boundaries. On this, their sixth studio release, 3 have compiled twelve tracks that embrace elements of modern metal, progressive rock, prog metal, and straight-up modern/alternative rock (albeit with wicked musicianship). Songs like “High Times,” “Pretty,” and “Afterglow” would sit well alongside output from bands like Jimmy Eat World, while the other tracks will appeal to fans of everything from Dream Theater to Foo Fighters. The melodic prog output on songs like the infectiously catchy “React” (one of my favorite songs of the year), the acoustic color of “On With The Sun,” and the technical performance on “Only Child” reaffirm that these guys have figured out how to strike a balance between musicianship, hooks, and clever songwriting. The closing track, a beautiful singer/songwriter-esque ballad, “The Barrier,” could land them on the soundtrack to any number of popular television shows. Led by vocalist and superb acoustic guitarist Joey Eppard (wicked fingerstyle technique) and joined by Billy Riker on electric guitars, Chris “Gartdrumm” Gartmann on drums (fantastic polyrhythmic chops), and bassist Daniel Grimsland, this group of musicians are continuing to build their worldwide audience, and the combination of epic, melodic, hook-laden prog metal with great production values ensures that this finest release is going to take the band to another level of commercial success. 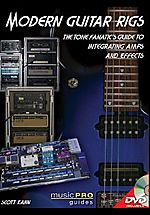 An easy and informative read that goes a long way to demystify advanced pro guitar rigs. Scott Kahn, MusicPlayers.com Editor-in-Chief and one of two guitar players in the progressive rock band, Days Before Tomorrow, can now add “Author” to his resume. However, this distinction is far more significant than just “bragging rights” for the simple fact that his inaugural book effort just happens to be the definitive book on the topic of pro guitar rigs and the only one of its kind. What makes this book so special is the light, yet informative way it is written. Sprinkled with personal anecdotes and “funnies” the book never gets too technical or “dry” especially for someone like myself who never really understood or cared about this stuff in the first place! However, after reading through the book’s 155 pages, the mystique has been lifted and not only did I get an education, I now want to build myself a pro guitar rig! Before we go any further, it should be noted that as a senior guitar editor around here, I have decades of experience with amps, tubes, effects, guitars, pickups, and speakers, and I know this stuff as well as the next serious musician. [Editor’s Note: he’s being humble — John is a tone guru with the chops to match.] But like you, I just haven’t given much thought to really building a professional guitar rig, despite owning and playing many of the finest tone-related goodies available. After a brief and concise first chapter in which Kahn gives his definition of a guitar rig, the book takes a deep dive into just about everything pertinent to the topic including: rack gear, multi-amp setups, effects loops, switching systems and audio loopers, guitar options, power conditioning and noise reduction. But wait, there’s more! The book also contains detailed dissections of rigs played by famous guitar players (including Kahn himself!) and interviews conducted with leading custom rig builders the likes of Bob Bradshaw and Dave Friedman (amongst others). Each of the twelve chapters is not only well written, they are expertly illustrated as well, with great product photos, drawings, and screen captures. I found the chapters on multiple amp switching and wet/dry setups most enlightening for the simple fact that for years, I have struggled with the concept of switching between two or three amps and grew quite jealous of guys like Eric Johnson who have that sort of thing down to a science. Reading through this particular chapter had an effect akin to taking blinders off and as it turns out, it’s not very difficult at all. Previously a topic I could barely fake up an explanation for, the chapter on wet/dry setups again illustrates the beauty of this book. The narrative is just technical enough not to alienate the expert or the neophyte (like me) and at the same time makes you wonder how you survived so long without the technology! Other topics covered (either in passing or in great detail) include rack-mounted guitar tube amps, custom cables, wireless systems, Piezo pickups for electric guitars (properly implementing their use), line mixers, tuners, MIDI foot controllers, and effects processors. The book’s ninth chapter, “Rig Infrastructure and Miscellaneous Goodies: Completing the System,” as well as the final chapter, “Putting it all together,” tie everything together nicely, but it appears that Kahn has saved the best for last! Chapter 10, “Suggested Uses and Rig Examples” is worth the price of admission alone. An absolute treasure trove of information is contained here by way of detailed descriptions and illustrations of famous guitar players’ rigs such as Alex Lifeson, John Petrucci, Steven Wilson and John Wesley of Porcupine Tree and yes, Kahn himself! The information contained here is absolutely priceless and Kahn deserves all the credit in the world for obtaining it in the first place, especially considering that some of the inclusions reveal the player’s “secret sauce.” For example, did you ever want to know how Alex Lifeson sustains that seemingly endless note at the end the solo in “Limelight?” Then read the book! The interviews conducted with famous rig builders in the book’s penultimate chapter, “Interviews with Rig Builders,” are enlightening as well, and go a long way to define each builder’s philosophy, gear preferences, and client list. The book is rounded out by a well put together glossary and a list of all manufacturers mentioned in the book. Finally, the book contains a DVD featuring our author as he walks us through some of the basics required to assemble and configure your first small rack or pro guitar rig, as well as a great pedalboard demo and complete dissection. Modern Guitar Rigs: The Tone Fanatics Guide to Integrating Amps & Effects will appeal to experts and novices alike. It is well written, witty, and chock full of useful information. But most importantly, it demystifies a topic that has been misunderstood, maligned and even ignored through the years. It’s one of those books that even if you don’t think you are interested, you simply cannot put it down once you start reading it. By the time you reach the final page, you will be filled with new ideas about what to do next with regards to your amps and effects. 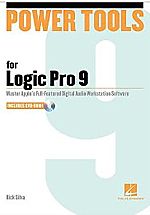 This book offers some great insight into the basics of Logic Pro 9, but advanced users should look elsewhere for true power tools. Power Tools for Logic is a good read for beginners, but we really wonder if the title shouldn't be more along the lines of “Power Tools for the Beginning Home Producer Using Logic.” It provides a good overview of Logic and provides some tips on how to streamline your creation process, but at no point does it get fully into advanced techniques for users already quite familiar with the program. At best, the book covers some intermediate-level topics, thus the title is a bit misleading. If you're an advanced Logic user, this book is not for you. However, if you are a beginning user, or if you are making the jump from another program, this a fine place to start. The structure of the book is well laid out, and makes sense. Each chapter ends with power tips, a keyboard shortcut summary, and a Tune-up section, which is a set of review questions from the chapter. These are a great help to remember what was covered in the chapter, and the keyboard shortcuts were especially helpful. We are big fans of the keyboard shortcuts in Logic, and it was nice to see them reiterated at the end of each chapter, although we also felt they could have been brought out a bit more (through bold type or italics) when they appeared within the normal body of text. The Logic Tune-up section is a good tool for teachers considering using this book in the classroom. The questions presented cover the main points of the chapter, and help to focus the reader in on the main points of the text. One layout misstep was the “Chapter Objectives” section in at the start chapter four. Objectives weren’t stated in any of the other chapters! Where did they go? The objectives would have been a great way to start every chapter, because you can see immediately what is going to be learned. The included DVD adds some good content, and makes the $39.99 price seem reasonable. Being able to see what is actually talked about in the text really helps to drive home the points covered in a way that text alone wouldn't. Overall, the tone of the book flows smoothly and doesn't feel like a manual, — it’s more like Rick is there talking to you, which makes it very comfortable and easy to read. We would recommend this book to anyone who wants to try Logic and see what it has to offer, but would say to look elsewhere if you already know a good deal about the program and are looking for tips and tricks to expand your Logic production skills.